Here are five basic things that can help overcome these sales objections, and that customers seek in Shopify stores. One of the first things you can do to incentivize purchases when customers land on your store is to highlight coupons. 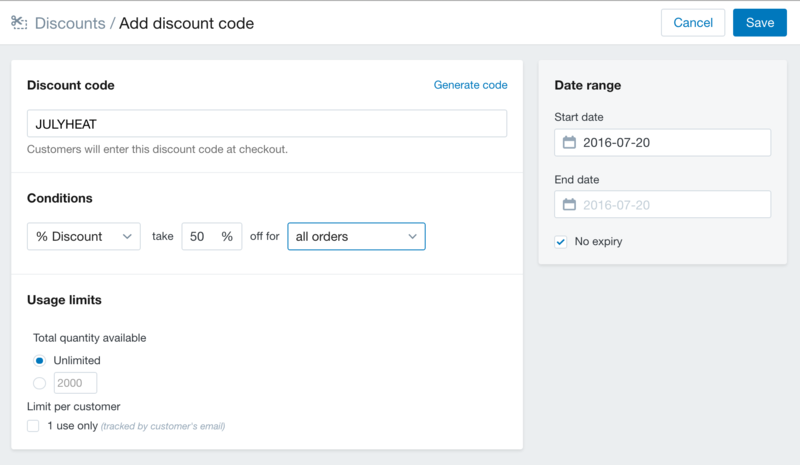 You can set up coupons under Discounts in your Shopify dashboard. Create a relevant discount code, like JULYHEAT in the summer or ANNIVERSARY50, rather than generic ones like STOREDISCOUNT. Relevant codes are more memorable, and signal that the code will be short-lived. Set conditions to offer discounts. You can offer specific value off, percentage off, and free shipping. You can set percentage off or free shipping above certain order values. In some cases, you may offer a set amount off, however the value of this discount diminishes as the order value increases. Customers will probably try to have a small order to get the maximum value from the discount. You can limit the usage to only a certain number, or better, limit one per person. This means that everybody gets to take part in the promotion, but a single customer doesn’t drive all the sales. Create urgency in your discounts by setting and highlighting the expiry date. 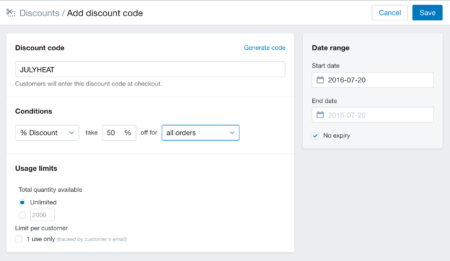 This will help you manage ongoing promotions, and set some urgency to use the code in customers. Once you set a discount or coupon, make sure to highlight it on your store. You can do this by creating a specific area on your store for coupons, adding a header bar, etc. If you offer a lot of discount codes for different things, feature these on your own store to make for an easier user experience. If people expect ongoing discount codes, they will search for them on sites like RetailMeNot. New customers may not know all the products on your store. In addition, returning customers may not know about new products on your store. In such cases, a recommended products area can help guide customers products they would be interested in based on their browsing history. You can use apps like Personalized Recommendations to manually assign products in recommendation areas, and automate recommendations based on browsing history. Take a look at the demo store for the app to see how it works. Most of us check what other people have said about something before purchasing it online. That’s why services like Airbnb, Uber, and Amazon consistently remind people to provide reviews and ratings based on their experience. Learn more about encouraging product reviews. One major thing almost all customers look for is free shipping. This is something that more and more stores offer. It tangibly reduces the cost of making a purchase, and can help push people over the last barrier to a sale. You can set up free shipping thresholds under Settings > Shipping > Zones and rates. Set the threshold a little over your store’s average order amount to constantly push up the average. Learn more about shipping in our recent post. This is a tricky policy to implement. However, it provides a lot of up-sides. Make a clear, easy, and accommodating return policy so that customers don’t feel like they may be stuck with a purchase. Even if they wouldn’t plan to return a product, knowing that they can, can ease their objections to purchase. You can further gain trust, orders, and customers by implementing a no-questions-asked policy, even if it is for a certain period – like 60 days after purchase. This gives people ample time to test out the product and see if they’re happy with it. eCommerce has grown rapidly over the last five years. This means that you are not only competing with your competitors, you’re also competing with experiences customers have on other online stores. Even though it is not a fair comparison, customers may still compare their experience on your store with that on other, sometimes larger stores like Amazon. In this post, we boiled down five things that customers often experience on large eCommerce stores like Amazon, and expect from other stores. These include highlighting coupons and deals on your store, including personalized product recommendation areas, reviews from other customers, free shipping thresholds, and a no-questions-asked return policy. You can gain your customers’ trust by implementing these ideas on your store to gain Shopify sales. Are there other basic things store owners can do to gain sales? Is there something that has worked for you? Please tell us in the comments below.